TI99/4A. I was told back in the day that it was slow. At first when I bought one, several years ago, I had to agree. After looking it over some recently, I've decided it's not so bad. I think it was just some unfortunate decisions in TI management that crippled it. It's a weird machine, but in my opinion the console has a great deal of untapped potential, and a good deal of room for improvement. The PEB looks to me like it has even more unused potential than the console, without any upgrades to its hardware. I think it's going to be a lot of fun for me to explore its possibilities. In a sense, practically every computer I've gotten has been a retro buy, because I enjoy being 2-3 years behind the curve and saving tons of money along the way. With a little creativity, there's infinite fun to be had. I started with a C64 a tad past its heyday, and marveled at how the graphics and sound were infinitely better than my friend's zillion dollar IBM. Going to an old 286 with a black & white monitor was practically a downgrade, but even there I never ran out of games to play. Loved hitting all the bargain bins at the software stores for cheap games every week. Even now, I'm typing on a used Cyberpower FX-4300 from Ebay and it's working like a champ. There are so many sub-$10 games available on GOG that it's simply not possible for me to get bored with it. In contrast, I finally bought a "real" PC this year with an i5-8400, M.2 SSD and GTX 1070...and it was a complete waste of money. Does Shadow of the Tomb Raider look great at 1080p ultra? Sure. But most of the time I don't even notice the graphics, because there's too much darn action. Worse still, I don't even like the game. Ended up donating the machine to charity and am not the least bit sad about it. I became a new fan of the ZX Spectrum after porting PLATOTerm to it. It is a machine that is far greater than the sum of its parts, and I've dived into the unique culture that has sprung around it. I now own two ZX Spectrum systems (on my way to me, different units), and an Interface 1, with a pair of microdrives, as well as a ZX HD HDMI interface. It is because I have had many moments like this, with multiple dozens of systems over 40 years, that I am a staunch fan of ALL OF THEM, and why I am trying to build an online service to bring ALL of the communities together. This computer has surprisingly excellent games such as Space Manbow and Castlevania among many others. Definitely the Amiga .. just an amazing disruptive technology for it's time. I too, am an Amiga fan, and I was in a house with minicomputers and workstations...to me...the Amiga was a REAL workstation for under $10,000...you can't underestimate the impact what a group of brilliant rogue computer designers had on every damned computer since. Yet another one who was impressed by the Amiga. Have to tip my hat to the old Kaypro IIs that my school had. Those had the best keyboards I've ever used. This was basically the C64 of Japan, in terms of being a comparatively low cost all in one computer/games console that was still affordable (rich kids got PC88/98 series). I ended up getting a refurbished Panasonic FS-A1F upgraded to function 99% as an MSX2+, and I was quite impressed by the machine. Lack of scrolling hurts, though the top developers seemed to be able to get around it. Great built-in music chip, and the FM-PAC makes it even better for those games that support it. You can even write disk images using a USB floppy on modern PCs, last time I checked. It's got a very powerful flash cart solution, but it's also somewhat difficult or counter-intuitive to use. It supports disk images, but it's weird about how to use them, so I just wrote a ton of 3.5" disks and use those, with the flash cart just used for ROM carts. My only exposure to this computer was through the many, many articles in Retro Gamer about it and its games. I honestly never got why, it just looked completely primitive. Several years later, my wife got me a ZX Spectrum Vega for my birthday and as I went through the games, I realized how great the library is. It's extremely impressive what people were able to make on that hardware. I've got the ZX Spectrum core on my MiST FPGA. It's an excellent core, but I really wanted "the real thing" and ended up ordering a hardware recreation called the OMNI DESKTOP 128HQ (still waiting for it to arrive). Djordje is _REALLY_ backlogged on orders. I ordered mine at the end of September, and it finally shipped last week, so I will see it sometime in 2054. Edited by tschak909, Sun Jan 13, 2019 1:43 AM. Same here, ordered around the same time as you. Looking forward to it arriving! Hey Thom, just wanted to mention that my ZX OMNI arrived yesterday! I looked over my records, and I had ordered early Sept, and it "shipped" mid-Dec. However, I think the shipment notification was an error, because it actually shipped early Jan. Anyway, it's a very nice unit, though it doesn't come with any documentation and you need to fool around with the dip switches to get the built-in divMMC working properly. It also comes with only an RGB SCART cable, but the cable isn't built properly (lacking a resistor) so needs to be modified to get the brightness level correct (if you have a quality Megadrive 2 RGB cable, it's the same cable). The best resource right now is the ZX Omni Facebook group, which has a lot of info on how to get the OMNI up and running. I picked up a LVOV (or LVIV) PC-01 from Ebay, for quite cheap. It's an Ukranian computer, a very basic Z80 affair made around 1987. No, this isn't a ROM hack or the youtuber's intro, it's really like that on the real hardware. Edited by CatPix, Mon Feb 11, 2019 9:26 AM. Usually they surprise me by being worse than I imagined. 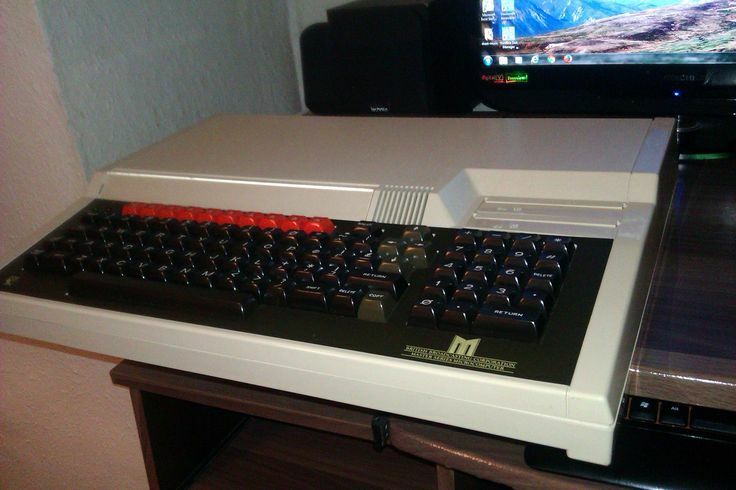 I used to be jealous of things that C64, Apple II, and Amiga could do that my Atari 8-bit and ST couldn't. But then I'd actually use one for a length of time and realize they weren't as amazing as I had imagined. on the C64, I used to think the SID sounded so much better than Pokey. Today, they both sound dated, I slightly prefer Pokey today because many chips that came after SID sound like SID, and Pokey sounds a little more distinctive. Amiga - what disillusioned me there most was the OS. On a floppy-based system it is highly annoying. Also entry level Amiga's don't have enough memory to really pull off their advanced feature like multitasking. I'm sure a high-end Amiga with hard drive would be much better, but I haven't used one. The only one I was positively surprised by was Mac-- the modern macs, not the retro ones though.. I had a similar reaction to actually getting an Amiga. Back in the 80s I had the 520ST, and it seemed every magazine article gushed over the Amiga's superior graphics and sound. Their capabilities seemed legendary, and given how disappointed I was with the ST, I guess the Amiga gained almost magical qualities in my mind. It was 2016 before I finally acquired an Amiga. An A500 with 1MB and an extra floppy drive, and yeah, it was a pretty big let down. Even with two floppy drives the boot-workbench-from-floppy Amigas are borderline unusable, and I can only imagine what someone with a single drive must have experienced by in the 80s. The clicking empty drive is annoying as hell, and Workbench 1.3 seems cartoonish compared to GEM. And even the games were a bit of a disappointment. I expected them to be smooth, to flow, to amaze. Mostly though they look more or less like the ST versions, but with massively better sound. Mostly though it was my unrealistic expectations that were at fault. I expected so much it was probably impractical that any retro machine could have delivered. Objectively they are great machines. Especially if you add an accelerator, 4MB RAM and a hard disk. A machine that did pleasantly surprise me was the Atari Falcon. After the ST I guess I expected to be disappointed. But TOS 4 is a pleasing upgrade with less garish colours. The internal hard disk is easy to replace with a CF card, and even the decision to switch to standard high density floppy drives seemed a sensible step. I was also pleasantly surprised to find that thanks to the efforts of many hackers, most ST games run flawlessly, and then there are a few Falcon native titles that are pretty cool such as Impulse X, Downfall and the Doom port Bad Mood. Sadly I've never had the opportunity to get one, due to the expense to purchase, expense to convert to domestic power, expense to upgrade and expense to ship. Of all the computers out there, I know this one would surprise me. I've lusted after one for at least a decade now, but have given up on ever owning one. I can tell you, from a software development perspective (including recent work, as I work on PLATOTERM), the Amiga trounces the Atari ST in terms of its operating system and API. Don't judge a system by lack-luster back-ports from the ST.
Yeah I had always thought GEM was pretty bad, but I didn't get to use an Amiga until I met someone in my college dorm who had one. Trying to use AmigaOS from a floppy was brutal. It gave me a new appreciation of GEM's speed, how it it didn't need to boot from a disk, and how simple operations were much easier. Now AmigaOS had more powerful features certainly, but it was a much more user-experience. Well most of the press were gushing about the great Amiga features, but they rarely talked about the downsides. I do remember one Amiga owner telling me he was jealous of my ST monochrome monitor. I couldn't understand why. Amiga specs said it could do 640x400 too, but in color! Why would anyone want a monochrome monitor? But then when I saw Amiga 640x400 in action and understood what 'Interlaced' actually meant, I realized why they would say that. They were innovative for sure, but they weren't the polished machines we imagined in our heads. While I'm not entirely sure about the Master 128 power supply, the one in the Model B actually has a jumper where you can convert it from ~230V to ~115V. You need soldering skills, and probably want some expertise in working with high voltage equipment, but supposedly it should be a rather simple procedure and unless your electrician charges by the minute, not particularly expensive. Of course you would need to change the plug as well. Caveat emptor about connecting modified equipment to the power grid. The GEM desktop does look like crap in low resolution but at least it's good for launching non booting games. In higher resolutions it really looks about as good as the Macintosh desktop. And it can be further imporved with desk accessories, alternate desktops and yes even multitasking systems. I'll give the Amiga workbench points for it's unique multitasking but the interface is anything but intutive, in spite of being called Intuition. The one retro computer that did surprised me is the Tandy 1000. Usually I ignored PC's made before the multimedia 486's because they were primary for business use only and the games that ran on the were rudimetary at best. But the Tandy 1000 was the prefect blend of a home computer and PC clone. Specs included 16 on screen colors that don't require an expensive EGA card and a three voice sound chip that's stiull better than the PC's piezo speaker. Plus it came with useful software that's easy to use and includes everything a home computer needs (word processor and checkbook balancer). And yet still runs DOS applications as well. Yes you can easily convert the power supply in a master to US Voltage. I have one here in CA. I would check in with Mark at RetroClinic as they can get you a really nice pimped out one for a reasonable fee and convert it for you. All you would need then is a conversion for the PAL output. I used a Beeb to Scart connector into a converter box that outputs HDMI. Looks amazing.